I couldn’t believe the first time I made it. In a few seconds I had a creamy jug of perfect mayonnaise. Every time I make it I still feel nervous and am always happy with the results. Except for the one time I tried to make a miso mayo and added cold miso paste into the mix before blending. The only time this mayo has split! I now add the miso paste at the end to be sure to be sure. The general rules of mayo making still apply. Make sure your ingredients are all at room temp (except for the boiling water). The other secret is to use a tall jug or container so that the head of the stick blender is covered by the non oil components. This is critical for getting the emulsion to happen. If the vessel is too flat you won’t get the right type of mixing to make the emulsion work. 1. Place egg yolk, vinegar, water, mustard and a pinch of salt in a tall jug (see note above for why). Pour in oil. 2. With your stick blender head on the bottom of the jug, blitz on high speed. As you start to see the emulsion forming, slowly raise the stick blender so the upper layers of oil get emulsified too. 3. Taste and season with extra salt if needed (this can help tone down any bitterness from the oil if using olive oil) or a little extra vinegar if the flavour is too flat. 4. 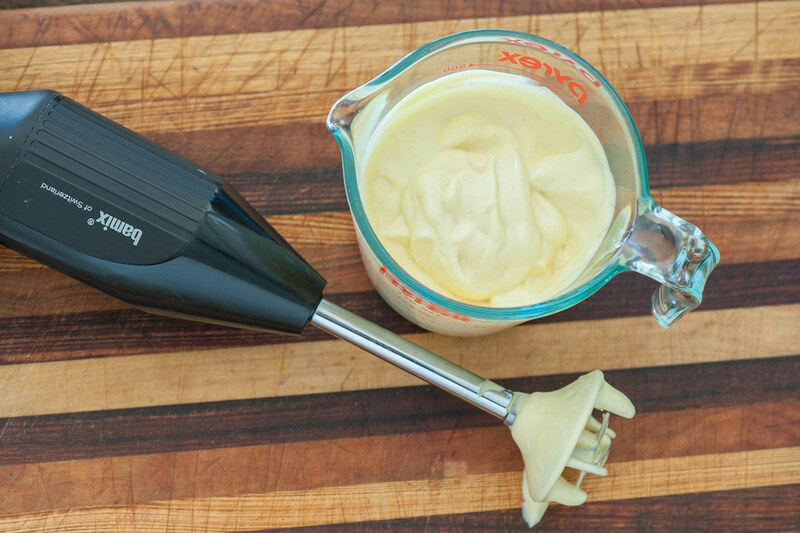 If the mayo is too runny, carefully add oil in a thin stream while mixing with the stick blender. This requires some dexterity. If too thick, stir in a little water using a spoon, one tablespoon at a time. NOTE: If your mayo splits or doesn’t form a creamy, thick emulsion, it’s OK! Just start again with a new egg yolk, vinegar, water and mustard. Pour the split mayo on top in place of the oil and cross your fingers this time. aioli / garlicky mayo – crush 1-2 garlic cloves with a little salt. Smash with the side of your knife on a chopping board until you have a puree. Add to mayo ingredients with the egg. chipotle mayo – replace water with 100g (3.5oz) chipotle chillies in adobo sauce. vegan / egg-free – Replace the egg yolk with an extra 2 tablespoons dijon mustard. Skip the water. miso mayo – stir in 2-3 tablespoons white miso paste (aka ‘shiro’ miso). If you can’t find white miso red or brown miso will work – just use half because these miso pastes are stronger in flavour. lemony – replace water and vinegar with lemon juice. For extra kick add the zest of 1 lemon. limey – replace water and vinegar with lime juice. For extra kick add the zest of 1 lime. preserved lemon – stir in 1-2 tablespoons finely chopped preserved lemon (you won’t need as much salt so best to taste and adjust seasoning at the end in stead of adding salt at the beginning). cheat’s Hollondaise / Bearnaise sauce – replace the oil with melted butter cooled to room temp. This will split once refrigerated so best to make just as you need it. different oils – I usually use a cheaper olive oil (not extra virgin) for my mayo because I find extra virgin olive oil (EVOO) overpowers. If you want more antioxidants and are happy with the punchy flavour use EVOO. The other oil I occasionally use is rice bran. herby – stir in finely chopped fresh herbs. Parsley is great for general use. Or basil. Or dill (magic with fish). pine nut – stir in a generous handful of cooled roasted pine nuts – amazing with fish, chicken or veg. 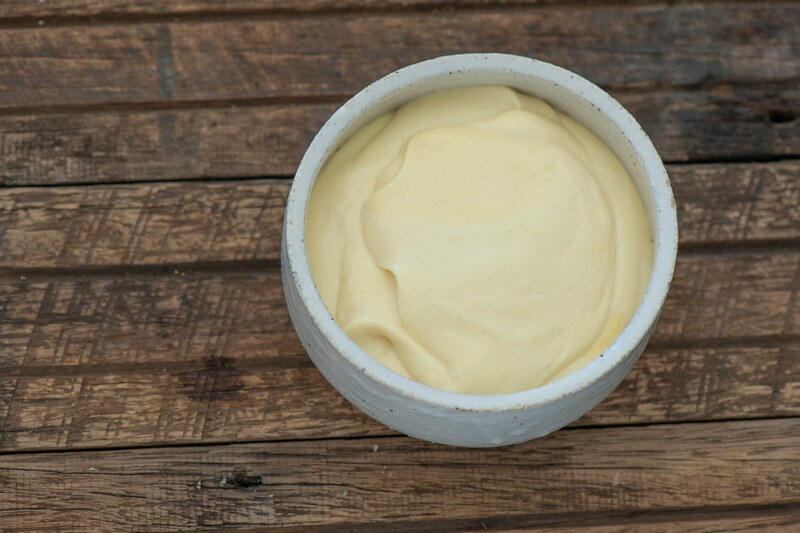 harissa mayo – stir in 1-2 tablespoons harissa paste. eggs – whole eggs will keep in the fridge for weeks or use for another meal. rice vinegar or white wine vinegar / dijon mustard / neutral flavoured oil – keep in the pantry. Yes! Will keep in the fridge for 2 weeks. Do not freeze!